Today, Cassie devotes the entire episode to answering listener and reader questions from Facebook, Instagram, email, and other social media. 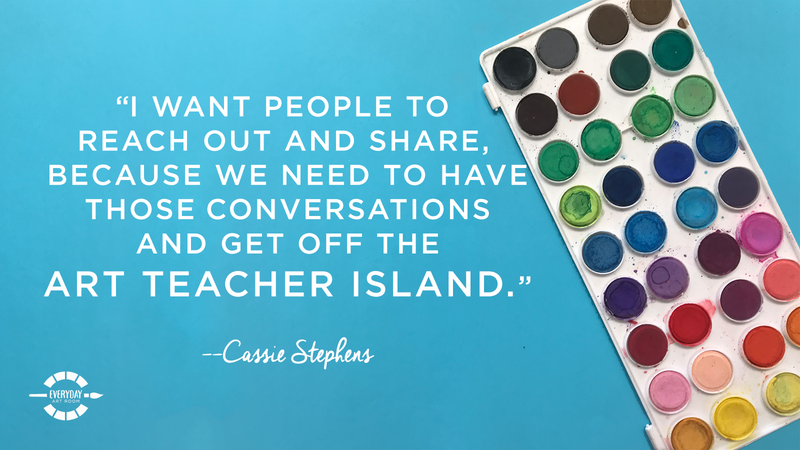 Take a listen as she talks about what we should love and appreciate about our jobs, why you need some bingo daubers in your room, and how you can deal with 42 Pre-K kids at the same time. Full episode transcript below. Cassie: Hello thee friends. I’m coming at you live from my art room. Now because I’m going to do anything special in this here podcast, concerning my art room, but simply because it has been one of those wild and crazy weeks where I’m scrambling to find the time anywhere I can. If that means I’ve got to do a little podcast recording in between art classes, then that’s just going to have to be the way that it is. Just a little side note, something fun and exciting. This weekend, I joined a group of five other art teachers. We went on a little road trip. We took an adventure to the High Museum in Atlanta to, see, how I can’t even talk. How do I teach all day with all this spitting and sputtering? To see the Yoi Kasuma art exhibit, and it was amazing. If you find yourself with an opportunity to check that out, even if it means you got to camp out a little bit the night before, I cannot say you got to enough. Can’t encourage you enough. It was amazing. Just a little side note, we’ve got to get out there more and check out these artists. When I went to see that exhibit, I thought, geez, I need to make a better effort to go to the monthly art crawls in my town in Nashville. 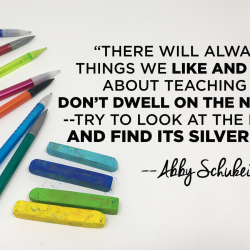 There are so many wonderful artists out there, and it’s wonderful for us to see that not just because we can share those artists with our students, but it’s inspiring for us as artists/art teachers. Anyway, I’m stepping off my soapbox now to jump into this here episode. I have an inbox, email inbox that is chock full of questions. If it’s one of the many flaws that I have, it is checking emails and responding. I’m the worst. Please allow me to reach out to those people of you who have contacted me, to answer some of your awesome and amazing questions. This is Everyday Art Room, coming at you live from the art room, and I’m Cassie Stevens. That’s right friends. This here is an entire mailbag episode. I’ve done a couple of mailbag episodes like this, and truth be told, mailbag episodes are kind of my favorite to do, first of all. Not so much on the prep. It’s pretty easy. Secondly, I love a Q & A sesh. My favorite thing to read in the newspaper growing up was Dear Abby, so this is kind of like the Dear Abby’s of my podcast. I’m going to dive right in with this first question from Kendall. Kendall is going back into the art room after a while, and she says this. “I am now on a quest to talk to as many elementary art teachers as I can.” Side note here, Kendall and all of y’all, if you want to talk to as many art teachers as you can, and don’t we all because we have that lonely island feeling, I feel like joining the Instagram community is a wonderful way to chat with a lot of art teachers. If you’re thinking, well if I join Instagram, how do I find those art teachers? The key is in following the correct hashtags. #Artteacher #artteachersinpire. #artteachersarethebest You just start searching for those, following those hashtags, those will lead you to art teachers, and those are the very best people on Instagram, let me just say. Also, Facebook has a lot of art teacher groups. There is the big one called Art Teachers. There’s also a couple of other for elementary teachers, and of course, don’t forget to follow The Art of Ed both on Instagram and on Facebook, and if you like, little old me. Getting back to Kendall’s question, she is on the quest to find as many art teachers to chat with as she can. “I think it’s very important,” she says, “that I first know what I would be good at, and then convince the administration that I’m the right pick.” Ah, Kendall’s looking for a job. “I have been following your blog on and off since I moved, and would love the chance to pick your brain. Here goes the questions. What do you love about your job? What challenges do you have? And what would you have wanted to know more than anything, during your first year teaching elementary?” Who wee, those are some $5 questions, Kendall. Okay, let’s start at the top. What do you love about your job? Does saying the fact that I get two months off in the summer mean anything to you? I mean, I’m just going to say, that’s not necessarily at the top of my list, but it is on my list. I’m not going to lie. All joking aside, what I love about my job is that I love to create, just like you guys. I’m passionate about making things. I love sharing that passion about creating, with my students, and seeing them also discover all of the magical things about creating. How colors are mixed together, especially the Kindergarten kids. They think all of this is magic. How to learn how to sew, learning how to weave, sculpting with clay, rolling your sleeves up in paper mache. Sharing all of those favorite media with my students, sharing my favorite artists and periods in art history with my kids, that’s what makes my job so much fun. I know y’all feel the same. Then, of course, the relationships that come out of that. On Instagram just last week, I was talking about how I tell my students multiple times a day that I love them. When they leave my room, we all sign, I love you. When they’re in here working, if they need a hug or if they want to hug me, I reciprocate, and I always share an I Love You. I don’t expect them to ever say anything back to me. Some kids aren’t comfortable saying that, but I want my students to hear that. Loving on those kids and giving them that love, is a big part of what I love about my job. Just sharing that art is fun. I love to have fun. I come from a background of drama when I was in high school, I was in a lot of plays. I just love kind of putting on a show for my students. That’s me. Those are my passions. 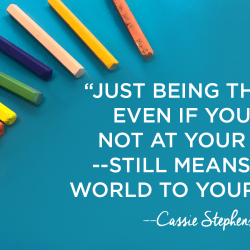 I think that finding your passion, as a person, whether that be sewing, or acting, or writing, or whatever, maybe it’s meditation, maybe it’s something that you feel truly connected to, you’re not going to be able to share that with your students, without being passionate about it. That passion is contagious. Those are just a few of the things that I love about this job. I could probably have a whole podcast on that, but I’ll go to your next question. What challenges do you have? It’s another tall order. I think I’m going to have to scale this one down to say that the biggest challenge I feel as a teacher who’s taught for 20 years, something that I find frustrating, is folks who are not in the Art Ed field, telling me how to run an Art Ed program. For example, I was just evaluated last week and I love my Admin, she does not listen to this, so I’m not just saying that she is fabulous. But prior to my evaluation, I was filling out the lesson plan template, which is the same for everyone, which is ridiculous. I don’t teach Math, I don’t teach Reading, it’s incorporated in what I do teach, of course, but it’s not my core subject to teach. Having me fill out this form, having me jump through certain hoops and making sure I’m saying all these buzzwords, and that my students are parroting them back to me, it’s very frustrating. We are the Art Ed experts in our building. For an outside whatever who knows nothing about Art Education to come in and tell us how to do our job, or worse yet, that we’re doing it incorrectly, I find flabbergastingly annoying, and yes, that’s a new word. One way that I’ve gotten around that over the years, is just by letting it roll off of my back. If I’m being evaluated and I didn’t jump through the correct hoops. For example, I always get dinged for questioning my students. If I get dinged on that on my evaluation, it’s fine. It’s not going to affect me as far as my pay or my job security. I know in some teaching situations, it may, especially as a new teacher, so it’s something to be a little bit more aware of, but I feel as though, as a teacher, I’m always trying to force myself to grow to do a better job. Of course I will take all those evaluation comments, with a grain of salt, but I do take them into consideration when I go back into my room, however, it’s just frustrating for me that I’m being evaluated, or the curriculum was written by people who don’t know exactly what it is that I do. I think that if you talk to any classroom teacher or any teacher of any subject, they would say the exact same thing. That kind of thing is frustrating for me. As a teacher who’s been teaching for a while, I’ve seen so many teaching fads, curriculums, standards. They come, they go, they get repackaged, they get called different things. Just as long as you are doing the best job that you can, talking to other art teachers, observing them, putting in those best practices for you, your situation and your students, then I think you’re going to be an amazing art teacher. Her last question is, what would you have wanted me to know more than anything else my first year teaching? I think that is it, to just not be overwhelmed but all of the ed you speak and just take a deep breath. Relax. Enjoy those kids, enjoy the new discoveries you’re going to make as a first-year teacher with your students. Know, you are going to mess up a whole lot. Me, as a person who’s taught for a long time, I mess up a whole lot too, just not nearly as much my first year teaching. Great questions Kendall. Our next question comes from Heather. Heather has a really unique teaching situation. She’s not in a classroom. She does three different homeschool coops. She has a question, which I’ll get to in a moment. What I find really interesting is her teaching situation. She says, “Each Coop meets for different amounts of time, some of them are once a week, some for a semester or a year. She also has clumped grade levels, meaning she’ll have 3rd and 4th, 5th and 6th, 7th and 8th, and even 9-12th. Each week, they do an in-class project, then they go home and they have a homework assignment. What a cool teaching situation. I remember when I was in college, everybody was telling me, oh, you’re not going to be able to find a job with your art ed degree. You’re not going to be able to make it. First of all, I never had any troubles finding a job, but I also did not have a problem getting up and moving out of the state I was in and coming to a bigger city. Sometimes, you might find yourself in a situation where yeah, there are no art jobs. What do I do? It sounds like Heather’s really managed to carve out an awesome teaching situation for herself. If ever you want to do a part-time gig, or you’re moving to a new place where you’re not sure if Art Education jobs are going to be available, it might be time to think outside the box like Heather’s done. What an amazing setup. But, let’s get to her question. Here’s my first thought Heather that popped into my head. It sounds like she’s got a lot of three-dimensional options, 2D, you know how we are, we have all these teaching examples. My first thought is to make a PowerPoint or a Prezi presentation with your examples in them. For example, if you’re going to be doing a landscape painted lesson. Instead of actually bringing with you that physical piece of paper that’s the landscape painting, why not take a picture of it, put it into a presentation, and then perhaps, you could go a step further and making that into your lesson. Let’s say that you’re going to show the process. You could do step by step photos of the process, or even a video, which my students really respond well to. Then this way when you come to your classes and you’re popping in and out of these sessions, you’re not having to drag all of these giant supplies with you. You can simply have your laptop. This is, of course, assuming you have some sort of television to hook your laptop up to share your examples, and your lesson with your students. If that’s not possible, I have found that at a yard sale recently, I got a giant file folder on wheels, like a hanging file folder. I don’t know exactly what it was used for, except perhaps this. I was told the gentleman I purchased it for was an architect, and he had large format pieces of paper. If you imagine what a hanging file cabinet drawer looks like, take that and multiply it times 4. It’s really, really wide and tall and deep, and I have that divided up by grade level, and I have my two-dimensional examples placed in there. I also, when I’m done with a lesson that has a lot of idea sheets is what I call them, or little visuals, or information about the artist, I’ll paperclip that to the work of art, and put it in that file folder. That way when I come back to a lesson later, everything that I need is clipped together. I can just pull that out, the example, and any kinds of a handout that I might need for my students. Something else that might help you is my first year teaching, I had a really nice storage unit, like a shelving unit. I went out and bought under the bed boxes. Under the bed boxes are great because they’re narrow, but, I shouldn’t say narrow, they’re not very tall, there may be six inches tall, but they are very long, and kind of sort of wide. What I loved about those was I could place large stacks of artwork in there. Perhaps, if you had one under the bed storage box for just 1st grade, perhaps all, or 1st and 2nd, how you’re doing your lessons, perhaps all of your examples and handouts could go in there. Once inside the box, maybe using a sheet of paper to try to divide the projects and the handouts out, might really help. Then if you have three-dimensional things that are a little bit bigger, those, of course, aren’t going to fit in your box, but I really want to circle back to just taking those pictures, and putting them in some sort of presentation or PowerPoint. I really think that that’s going to save your sanity as far as just having all of these examples and things up. Great question Heather. I feel like the organization is everybody’s biggest struggle. At least it’s mine. Okay, Dawn here goes. I use India Ink. I order whatever India ink is the cheapest. I have not noticed that one brand woks any better than the other. I do shake the bottle up through because sometimes it’s maybe weird and clumpy, I don’t know. I squirt a little bit into the bottle, the bingo dobber bottles, y’all, in case you’re not familiar, can be found in your art supply catalog. You can, and I think they’re a little cheaper on Amazon, you can get them in a group of 12. If you’re familiar with the Artist, Mr. Doodle, and you’ve seen Mr. Doodle at work, if you’ve not, you should check him out. He always uses what we’re talking about. I call them paint makers to my kids, they’re actually Bingo dobbers, which is the little dobber things that people use when they play Bingo. We fill them with, in my room, India Ink that I add just a splash of water to, just to water it down a pinch. When my students are using these, I never fill them beyond half full. A little really does go a long way. It is India ink, it is permanent. My students wear aprons, we roll up our sleeves, and we talk over and over and over again about how this is permanent, and we need to be extra careful. There you have it, the infamous, what is inside your bingo dobber questions. It’s India Ink, slightly watered down. This question comes from Jonna. Sometimes when I read y’all’s questions, I feel like I just want to say, how do you do it? I think the rest of us, sometimes when we’re kicking the can around, moaning and groaning about our teaching situation, or we’re having kind of a bummer of a day, I want you to think about this description, what I’m about to describe to you. This is Jonna’s teaching situation. “I’ve been teaching art for 11 years and love almost every part of it.” I think that’s all of us. “My challenge right now is that I teach,” Okay y’all, check this out, “33-35 Kindergarten students, with no help, and,” hold on to your hats people, “and 42 pre-K students with 2 para pros.” I’m just going to let that sit there for a moment, try to wrap your brain around that one. I’m running into problems, oh geez, I wonder why. With trying to teach that big of a group, so I have incorporated Play-Do every other week. I’m just going to say right here. Are you nuts? Play-Do with 42 Pre-K children. Okay, let me go back to the question. I tried to paint a couple of times, and it was, each time, a really big disaster. In the past, my Pre-K and Kinder have done great, but again, the number of students has just been so high. If you have any suggestions, or lesson plans that I could do for both grades, I would love some feedback. Never having taught that insane amount of students before, I want you to take what I say with a grain of salt. We’re just going to start right there. I’ve never, I mean, I double up my classes sometimes to get an hour, my 3rd graders and my 4th graders will sometimes come double up, but I’ve never had 42 kids under the age of 5 in my room at once. That, even with two paras, that’s bananas. My first step would be to find out, if you’re in a public school, find out if this is actually something that’s legal? I would hate for anything to happen to a child. Period. Then I would hate for anything to happen to a child, and have it fall back on your shoulders, since you’re the adult in the room. First thing that I would do is make sure that this is legal. I would go to your Admin and just say, something doesn’t feel right here. I fear for the safety of my students. It’s not because of your lack of classroom management, and don’t let them even go there with you, it’s because you have 42 Pre-K kids, and 35 Kindergarten kids. Something’s not right about that. Okay. That’s where I would begin first of all. Second, I think when you have a large amount of kids like that, you’re going to have to have a really firm routine. The kids are going to have to walk in, know exactly where they’re going to sit, come in quickly, quietly and sit. If I had that large a group of kids, I honestly would still start them off by sitting on the floor. When I have my students come in, they always sit on the floor. The reason I do that is because there’s no art supplies in front of them, I can see all of them, I can see that all of them are either listening or not, I can see who’s listening or not, and I know that their eyes are on me, their hands are empty, and they’re going to be a little bit more focused. I say a little bit more because let’s be honest, Kindergarten and Pre-K, a little bit of focus I about all you’re going to get. Starting at that point, and if that means, like I said, you got to clear a big space on the floor, do so. Starting there, I would consider starting with some sort of breathing, or meditation, dim the lights, you need to calm them. One of my favorite things to do when I have students who need to be calmed, is something called palming. I have a video of myself demonstrating palming on my YouTube channel. Essentially, it’s when you rub your hands together very slowly, and the kids do this along with you, so they’re rubbing their hands together. When you count 1, they rub a little bit faster, 2, rub a little bit faster, but not crazy, just so they can feel the warmth over their hands. When they say 3, they’re to stop rubbing their hands together, place their warm hands over their eyes and just keep them there until you say 3 again. When they have their hands on their eyes, that’s usually when I lower my voice, slow down my pace, and I have them take a deep breath in, take a deep breath out, and I say, when I say 3 again, you’re going to put your hands in your lap, we’re going to read a story, and then I very slowly count to 3. The students by then are a lot more calm, a lot more settled, and are ready to listen. Having those little things in place will help the group itself calm down. I would definitely begin with a story, or a book. You can never go wrong reading to kids. Reading to kids about artists, or other kids creating art, like the dot, or fish, beautiful oops, all of these wonderful things that you can share with your students. From there, I would dial back on the super messy stuff. I definitely would not be bringing out the Play-Do, unless you’re able to get another para in there who could have small group play, and activity with your students. I would consider starting a lesson that I just did with my kids, which was texture rubbing. My students really enjoyed it. It’s one that you can find on my blog. I have a lot of Kindergarten lessons on my blog. If you pop over there and just search Kindergarten lessons, you’ll find some that I feel like will be a lot less messy and stressful for you. With Kindergarten, we do a lot of oil pastels. We do a lot of watercolor paint, not liquid, but just in the paint pans. Supplies where they’re still creating and making, but they’re not the very messy supplies that would be hard to maintain when you have such a large amount of kids. Then of course, at the end of class, I would, I don’t know how long your class session is, but I would consider bringing them back down to the floor, bringing down the mood a little bit more, and getting them calm before they leave. I never enjoy a class session where we work up until the last minute, and I realize I’m late, and then I have to have them do a rush at a cleanup job, and a rush at a lineup job, and we just didn’t have closure. We didn’t talk about what we learned today, we didn’t have a moment to give hugs and High-5s. I think bringing them back to the floor and having a closure is good. When you have that large of a group of kids, don’t feel like you have to have them painting the Mona Lisa, doing all these big and extravagant things. Give them a loving, fun, colorful art experience. One that will allow you to keep your sanity with that many kiddos. Great question. Tim: Hello, this is Tim Bogatz from Art Ed Radio. 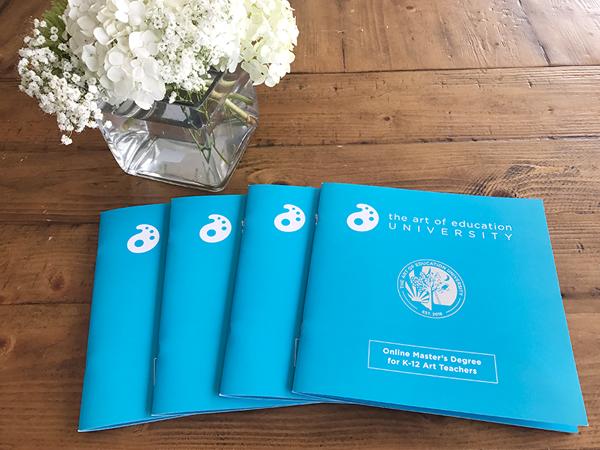 As you’ve heard me saying, we are just a couple of weeks away from the Art Ed Now Winter online Conference. On Saturday, February 2nd, we’ll have over 20 presentations that are all online, all incredible, and all relevant to what you’re doing right now in your art room. We have opportunities for hands on art making, we have new ideas, we have inspiration, we have a full day of engaging in professional development. Maybe most exciting, we have animator Paul Topolos as our featured presenter, talking about the work he has done like The Incredibles, Toy Story 3, Cars, Finding Nemo, Ratatouille, Wall-E, and just about every other Pixar film. You can learn everything you need to know about the Conference and get registered, at ArtEdnow.com. Make sure you go check it out after this episode is over. Cassie: My last question of the day comes from Carly. Carly says, could you tell me where you got your foam floor mats? My school has to get rid of a bunch of carpet for mold reasons, eww. I have a unicorn and rainbow theme happening in my room, and I would just love to know where you got your foam mats to bring them into mine. First of all, I really, I know I’ve talked about this before, I really think carpet is gross. I feel like it’s just like having a great big, germy sponge sitting in your room, where eventually, somebody is going to do something unfortunate on that rug, and I don’t think I even have to describe to you what I’m talking about. I do love a cushion on a floor, and so do my students. I, last year, from Amazon, found these floor mats. They are like, I’m looking at them right now, they look like they’re 24 inch squares. They’re the kinds that are about a inch thick of foam. They kind of lock together, you kind of snap them into place. I bought two sets of them, and they fill a very large area in my early finishers corner of my room. My students love it. My older kids, for some reason, think it’s magical to be able to take your shoes off before going in there. That’s another way that we’ve preserved that floor mat to keep it nice and clean. Like I said, it’s a foam mat, and it’s from Amazon. If you try typing in the rainbow floor mat, I think you’ll find it there. I’ve had mine for a couple of years, prior to that, I had another foam kind of clip together. I say clip, but they kind of pop in together like puzzles, foam mat that I scored at Walmart. It had a faux wood flooring kind of look, which I really loved, until my students figured out that the faux wood flooring was actually a sticker and started peeling it off. Why do they have to peel all the things? It didn’t look quite as cute when half the faux wood was chipped and peeled off. I have found these new rainbow foam ones to be the best. Added bonus, it was only like $120. I mean it’s massive. So much cheaper than a rug or carpeting. I cannot … I keep messing up my words. I can’t encourage you enough to check it out. That was a lot of question. I managed to get through five in this here Mail Bag episode. Looks like I’m actually going to start tapping into my emails and responding to folks, or I could just follow up with more of these in next week’s podcasts. I’ll save them though for the mail bag portion of the podcast. Thank you so much for always reaching out to me, always sharing your wonderful ideas and your happy, warm fuzzies. I honestly love it all, I appreciate it. I just wish there were more hours in the day to always respond to you amazing, amazing folks. In the meantime, I’ll just try my best to do so right here. Have an awesome week guys. 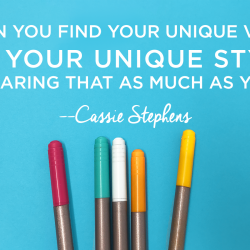 This is Cassie Stevens, and you’ve been listening to Everyday Art Room.